FRAMINGHAM, Mass. 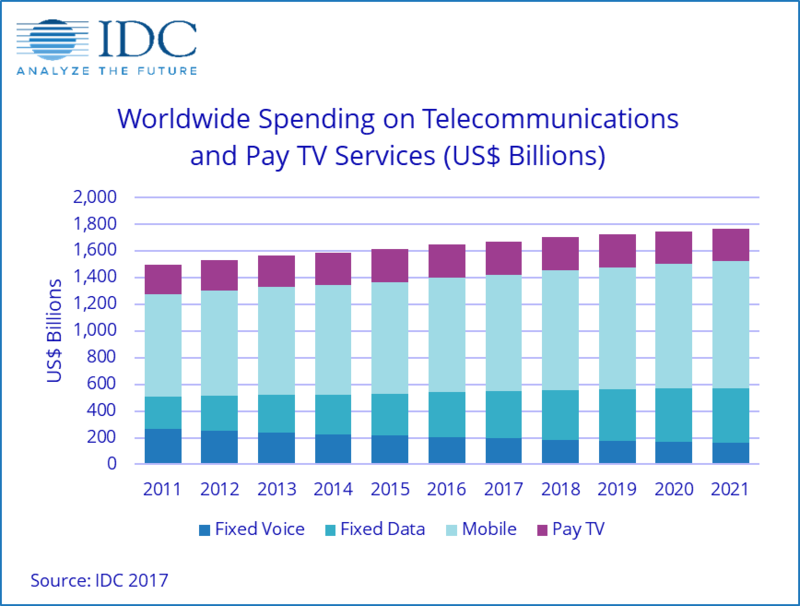 December 4, 2017 – Worldwide spending on Telecom Services and Pay TV Services is forecast to reach nearly $1.7 billion in 2017, an increase of 1.7% over 2016, according to the International Data Corporation (IDC) Worldwide Telecom Services Database. IDC expects worldwide spending on Telecom and Pay TV services to grow 2% year over year and surpass $1.7 billion in 2018. The largest segment of the market is Mobile which represents 52% of the total market in 2017. The Mobile market is expected to have a compound annual growth rate (CAGR) of 2% over the 2017-2021 forecast period, driven by the growth in mobile data usage and M2M applications, which is offsetting declines in spending on mobile voice and messaging services. Fixed Data service spending represents 21% of the total market in 2017 and that is set to grow by a CAGR of 4% driven by the need for higher bandwidth services. The Pay TV services market, which consists of Cable, Satellite, Internet protocol (IP), and Digital Terrestrial TV services, will remain flat over the five-year forecast period. However, these services are an increasingly important part of the multi-play offerings of telecom providers across the world. Spending on multi-play services is forecast to increase by 9% in 2017 and by 7% in 2018. Spending on Fixed Voice services will experience a CAGR of -6% over the forecast period and will represent less than 10% of the total market by 2021. Rapidly declining TDM Voice revenues are not being offset by the increase in IP Voice. On a geographic basis, the Americas will be the largest services market with revenues of $635 billion in 2017, driven by the large North American sector. Asia/Pacific will be the second largest region, followed by EMEA. The markets with the fastest year-over-year growth in 2017 will mainly be the emerging markets of Asia/Pacific, followed by EMEA. "The steady growth in the worldwide telecom market is driven by the need for IP services and higher bandwidth services, which are more than offsetting declining legacy telecom services," said Courtney Munroe, group vice president, Worldwide Telecommunications Research at IDC. "Mobility is and will dominate the overall telecom market as users in both developing and developed markets increasingly see mobile services based on 3G, 4G and, in the near future, 5G, as a key component of both personal and business communications," said Kresimir Alic, senior program manager, CEMA Telecoms & Networking, and Worldwide Telecom Services Database.